In Fall 2014, the Strategic Planning Working Group developed a comprehensive plan for the library’s future, published in early 2015. We’ve published the bulk of the text below, but you can also download the full strategic plan. If you have feedback, questions, or concerns, please contact us. From repository to collaboratory: investing in connections, content, and communities builds on the accomplishments gained while guided by the Library’s previous strategic plan, Building on success. Major themes: collaboration/sustainability/creating exceptional experiences. Plan will guide us over the next five years as we continue to grow and develop, and outline priorities for we how we can deliver the most value to our user communities. What we do, we do for our user communities. Enabling student success is foundational to our activities. With the opening of the Student Learning Centre, the Library will have unparalleled opportunities over the next five years to revisit our physical infrastructure to ensure that we are providing inspiring spaces for students to collaborate, research and learn. We will open new spaces, such as the Digital Media Experience, and re-envision existing ones, like our proposed fourth floor Archives and Special Collections research hub. Our virtual space is of equal importance to our user community. Our students expect to be able to discover the resources they need regardless of their discipline, location, or access method. We must provide intuitive, functional and accessible tools and resources for our users to provide an effective and satisfying online experience. Our physical and virtual spaces are an extension of our services. Knowing that every interaction has the potential to enhance student experience, we will undertake reviews of our policies and service models. We will increase our capacity to support the dynamic learning environment at Ryerson, including working with partners to support e-learning, zone learning initiatives, and entrepreneurial skill development. Collaborating with partners such as Student Learning Support and Equity, Diversity & Inclusion will also be key to providing holistic, visible support for our students’ out-of-classroom experiences. A key to success in this is ongoing consultation and assessment. We must ground our decisions in evidence and use input from our communities to drive our policies. This will allow us to be responsive and nimble as we face a period of great change. Improve the Library’s facilities to create healthy, configurable, and flexible learning spaces that encourage collaboration, research, and independent study. Develop the Library’s web presence to facilitate teaching and learning by enhancing the discoverability of our collections and services. Enhance the Library’s ability to support the information needs of diverse learners and facilitate the development of lifelong learning skills. Improve capacity for effective teaching, both online and in person, and engage faculty in embedding Library services, expertise and resources into the curriculum to enhance student achievement. Strengthen collaboration with Ryerson partners, both academic and administrative, to provide holistic support that will improve student success and retention. Transform service models to enable the highest quality of service to our user communities. Develop a robust assessment framework that will allow the Library to improve spaces, services, and collections through ongoing user consultation and research. The Library plays a critical role in advancing Ryerson’s research agenda through the creation, collection, curation, and dissemination of knowledge. Ryerson is experiencing a period of dramatic growth in research activities; the Library must ensure it can effectively support the research needs of faculty and graduate students, both within traditional disciplines and in emerging interdisciplinary areas. To accomplish this, we must creatively collaborate with regional and national partners to ensure the widest possible access to research materials in a time of decreasing resources. We will enhance our leadership and support of the increasingly complex scholarly communication world, with particular focus on copyright and open access. An “Open @ RULA” initiative will allow the Library to develop and promote new mechanisms that reward open scholarship. The expert knowledge of our staff will allow us to become a focal point of the university in these areas. In collaboration with bodies such as the Canadian Association of Research Libraries and Ontario Council of University Libraries, we will grow capacity to support emerging SRC needs like research data management and storage. We will ensure the Library’s expertise, tools, and services will enable researchers to meet funding requirements. We will assist researchers in ensuring their research has the highest possible impact. 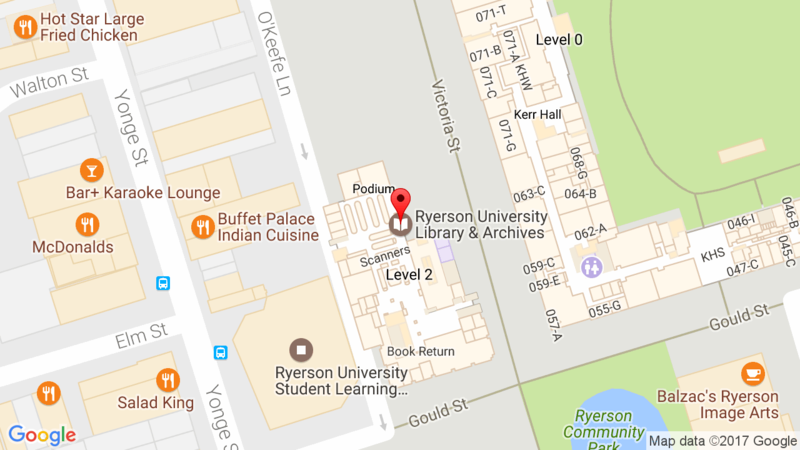 Through the development of the Library’s research repository and advocacy efforts, the Library will partner with graduate students and faculty to make accessible and preserve Ryerson’s SRC output. Increase capacity to develop research-oriented collections in identified areas of Ryerson cross-disciplinary themes, involving special, archival and print and electronic collections. Align processes and support structures to ensure the Library can provide excellent stewardship of research materials in a fiscally responsible, transparent fashion. In collaboration with regional and national partners, build capacity to support the emerging scholarly communication needs of faculty, graduate students and research centres. Develop researcher-centred services that foster research collaborations and expose, publicize and preserve Ryerson’s SRC output. The Library has earned a reputation as a driver of innovation within Ryerson, and seeks to sustain that momentum over the next five years. Core to the ability to innovate is a strong, stable infrastructure. The Library must support the technology needs of new spaces, such as the SLC learning labs, and build on popular new services, such as the mobile learning initiative. Within that infrastructure, the Library will establish a leading role for itself in development of strategically important library technologies. Within the next five years, the Library will have a new Integrated Library System and Digital Asset Management System. This large scale change will provide unique opportunities to develop new ways to serve our user communities. An innovative organization needs to be effectively organized. The library will review its departmental structure, professional and paraprofessional roles, and committees to ensure that the Library can grow and change in response to an expanding mandate. Finally, an innovative ecosystem starts with people. In order to take on the challenges we have set for ourselves, we must establish high quality training and development for our staff and librarians. By focusing on collaborative, experiential learning we hope to develop a pervasive culture of innovation within the Library, allowing innovation to happen at all levels of the organization. Among librarians, priority will be placed on developing SRC skills, as librarians have a dual role within the institution to both support and undertake SRC activities. Build a flexible, sustainable and progressive technological infrastructure to address the existing and emerging needs of the Library and its users. Become a leader in the development of sustainable, innovative library technology tied to our values. Explore new organizational models and informal collaborations that better support collections building, research, and teaching in a dynamic, collaborative environment. Foster a culture of innovation among librarians and staff by supporting ongoing professional development and experiential learning. A major focus for RULA for the next five years will be developing our unique and archival collections to drive community engagement. We will enhance our collections in response to university and community needs and build donor relationships, with City Building as one collections focus. We will provide the widest possible access to our unique materials through a carefully planned digitization program in collaboration with campus stakeholders and peer libraries. We will build on our vision of the Library’s user community in order to better serve alumni, high school students and the GTA community. With effective campus partnerships, we can enhance our ability to establish appropriate services for underserved populations, such as first generation students and Aboriginal communities. Finally, foundational to success in all our efforts is enhanced communication. We will increase the visibility of the Library and articulate and advocate for the role of librarians in setting, achieving, and measuring institutional outcomes. Increase the visibility and accessibility of unique collections through the expansion of the Library’s archival and special collections. Develop a digitization and preservation program to enhance access to unique and high profile collections and participate in regional digitization and preservation efforts. Build connections with Ryerson communities through targeted services, collaborations, and development opportunities. Develop a comprehensive marketing and outreach program to improve use and understanding of Library resources and services across faculty, staff, students and the community.